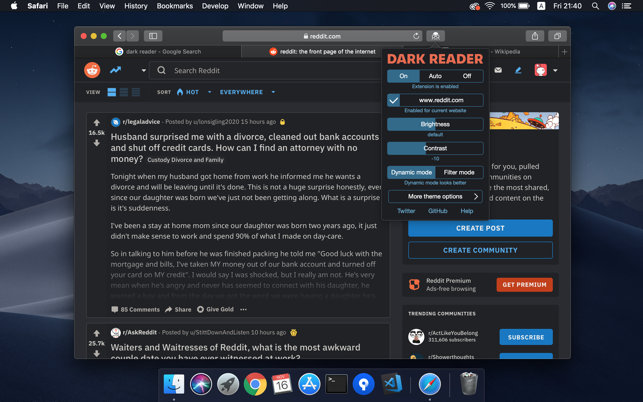 This is hands-down the best Dark Mode Plugin for Safari. Compared to the other plugins I've tried, the quality of the rendered page is just worlds better in Dark Reader. Very good results. Still, this extension could be beter. While Dark Reader permits the use of domain-specific overrides, there is currently no way to change settings for a sub-page on a site. Also, it costs $5, which is a lot considering this same plugin is free on other browsers, and the fact that the Safari version has a more limited feature set. I'm willing to excuse this to a certain degree because the market for similar extensions on Safari is not very competitive right now. Plus, I'm willing to bet that the Safari version follows a separate development track due to the way Apple structured things. I estimate that Dark Reader for Safari works for about 80% of the websites I visit. There are 2 main modes, Dynamic and Filter. Dynamic is supposed to look better and Filter is faster. However, I don't find that Dynamic usually looks better, so I've been using Filter. On some websites, Dark Reader inverts everything, including photos so that they look like negatives, which is not good. On other websites, fonts become unreadable because they are the same color as the background. I contacted the developer about this but he has not responded. Lastly, the free Chrome extension contains more options than the paid Safari version, which makes no sense. The developer's website says "Most of the features will be ported soon," but who knows when that will be. Update: Have removed another star in light of the developer's disingenuous response. The warning text I quoted in my original review below comes from Dark Reader's own preferences pane in Safari! The issue is not whether or not the developer is currently exploiting these permissions, but that they *can* be exploited, unlike Content Blocker extensions (e.g., Wipr, whose preference pane reports that it "does not have permission to read or transmit content from any webpages." The developer's contention that "Every update passes manual review by Apple" is hardly adequate assuagement; here are a few headlines from September 2018 that a quick search turned up: "Mac App Store apps are stealing user data", "More malicious apps found in Mac App Store that are stealing user data", and "Top-grossing Mac App Store app steals users’ browser histories". Original review: The Mac App Store should really list the required permissions for apps. 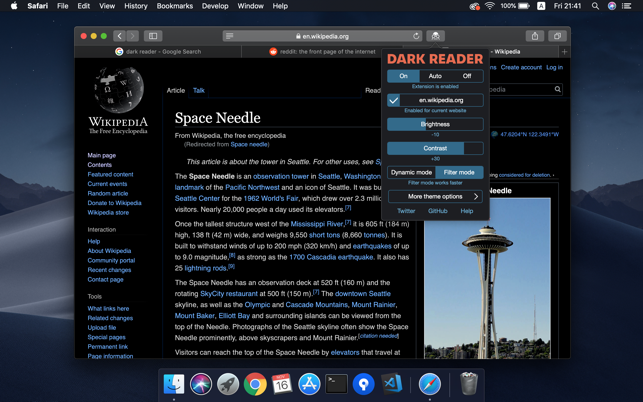 Dark Reader works beautifully, but requires full access to webpage contents ("Can read sensitive information from webpages, including passwords, phone numbers, and credit cards on all webpages") and browsing history ("Can see when you visit all webpages"). If this were disclosed before purchase, it would be a 5 star app. Dark Reader DOES NOT read your passwords, credit cards and browsing history. Every update passes manual review by Apple. 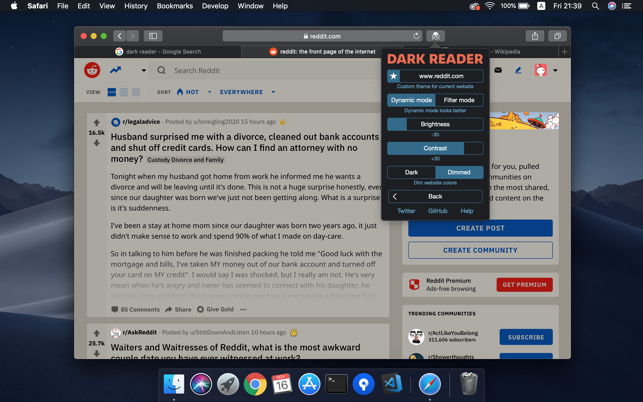 Dark Reader only analyzes and generates stylesheets. - You can always see what Dark Reader actually does in your browser: open Safari Debugger, find darkreader.js file, the code is not obfuscated (but still copyrighted). - If I ever decide to steal your data, I will be put into prison, the laws in Belarus are severe. FBI and KGB work closely when it comes to catching cyber criminals, even when a person does a legal activity in the US but illegal in our country. It's not like Zuckerberg, just saying "sorry" will not mitigate the punishment. - My account and the whole Apple ecosystem is protected from hackers' interventions. The number of Safari users is too low to become interesting for such attacks and costs for such an operation are higher than a potential trophy. There were some unsuccessful attempts to break into my Chrome developer's account in the past, I even had some fun giving a "f***y**" password to such an attacker. - I'm developing Dark Reader since 2014, it is a great achievement and responsibility to take care of 700,000 users' eyes. Some analytics company recently suggested me $20,000/mo for adding their script into the Chrome app. But this is out of my interests. I'm not Facebook and your data is not my business. And also I'm not Google and I'm not going to show you ads. I only care about my and your eyes, a lot of ideas are going to be implemented and Safari buyers with Chrome and Firefox backers make it come into reality. 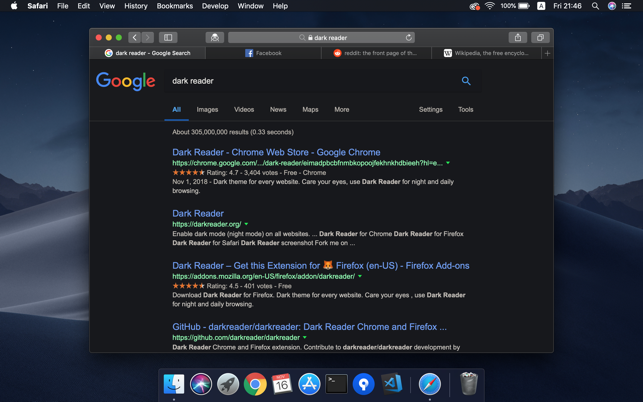 I believe Dark Reader will become a built-in part of every browser some day (at least in it's most basic form), so there will be no more need in such extension with broad permissions (I know what I'm talking about, Google suggested me to work on this feature in Chrome, but I cannot relocate at the moment).